Formed by volcanic eruptions – which took place 24,000 years ago and covered the slopes of the island with a pumice layer – boasts extraordinarily wild and natural beauty. The volcanic island of Nisyros is best known for its black-sand beaches and hilltop villages. Located in the Aegean, it forms part of the Dodecanese group of islands. It is refreshingly free of tourists and has even been dubbed ‘the Greek island no one has ever heard of’ by Condé Nast Traveller. Feel the texture of the active volcano under your feet, listen to sulphur springs hissing, go down the crater of an active volcano… Intrigued yet? 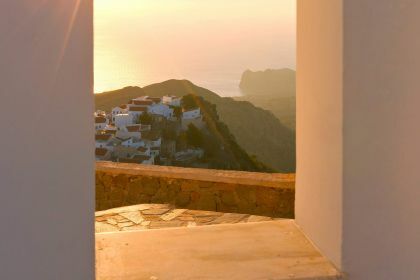 If so, a yachting vacation to Nisyros — lying between Kos and Tilos — promises an exhilarating experience, blending culture, history and scenic marvels. Nisyros’s active volcano, the youngest in Greece, is located in the centre of the island. You can’t miss it: the pungent, simmering crater and its stark beauty lures travellers to this remarkable island. Of course there is much more to Nisyros than its volcano. With their traditional architecture and spectacular views, Mandraki and Nikia are two of the island’s most picturesque villages. 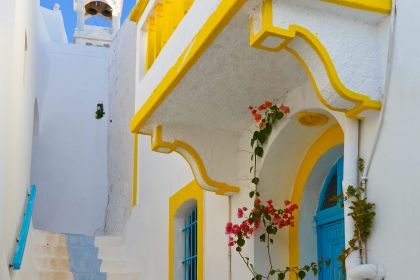 You’ll enjoy wandering Mandraki’s narrow, maze-like streets, admiring pretty flower-filled balconies and gardens, and atmospheric, cobblestone alleyways. Mandraki’s archaeological museum and the Museum of Volcanology are also worth a visit, offering you a glimpse into its fascinating past. Perched on an imposing rock above Mandraki is the exquisite hillside monastery of Panagias Spilianis, which dates back to the Middle Ages. 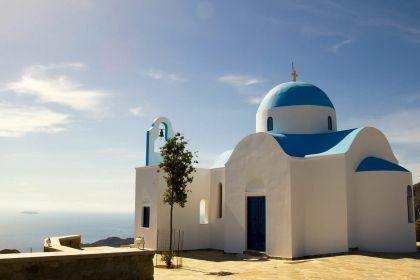 Accessible via 270 steps, it’s been the religious centre of the island since the 18th century, and is famous for its miraculous icon located in a small chapel. A visit to hilltop Nikea, meanwhile, with its azure seas on one side and imposing volcanic mountains on the other, offers eye-watering scenery and vistas that seem to go on forever. Fresh octopus hanging outside, mouth-watering souvlakia, brightly coloured tables and chairs, hospitable owners, unforgettable panoramas… Nisyros is a gem for traditional authentic Greek-island cuisine. Recommended restaurants include Captain's House taverna, offering tasty homemade dishes like pittia and wild caper salad; Irini in Plateia Elikiomeni, which offers a wide range of delicious dishes, from ladera to roasts; Ouzerie Paradiso, and taverna Nisyros, which remains one of the most popular and authentic eateries in Nisyros. Insider tip The volcano can be brutally hot and dry, so it’s best to plan your visit to Nisyros around the caldera hike (a caldera is a volcanic feature formed by the collapse of a volcano into itself, making it a large, special form of volcanic crater). 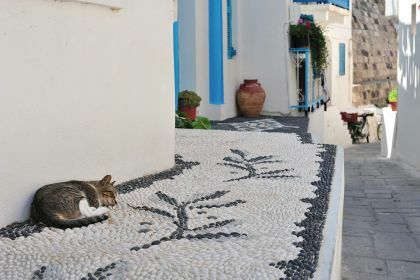 Having completed the volcano tour, you can sit back and relax in the shade of pomegranate, citrus and fig trees, sampling local specialities and watching some of Nisyros’s many cats at play.